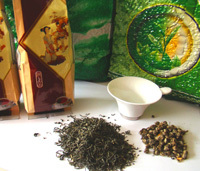 Description: An excellent tasting good quality Chinese green tea with delicate fragrance of Jasmine as loose tea. Usage: Start with a small amount e.g. 1 tablespoon to approx. 500mls (one pint of water) or half teaspoon per cup. Gradually increase as you get accustomed to the taste. Steep for 3-4 Minutes to allow the full flavour to develop.